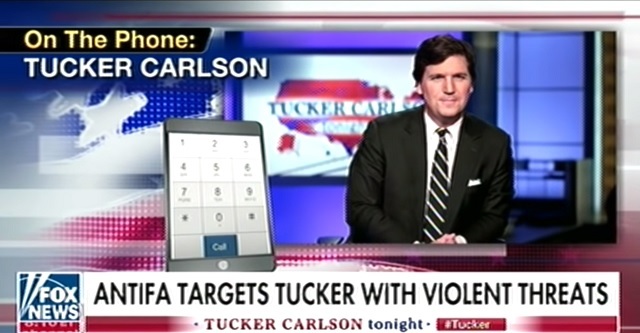 Tucker Carlson spoke out Thursday night on Fox News after an unhinged antifa mob terrorized his wife at their family home in Washington DC. Carlson added that before he was even able to reach his wife by phone, his brother and the police were able to get to her and make sure that she was safe. “We lose sight again of the fact that the country is overwhelmingly normal people who don’t think that this is acceptable. Our conversation publicly has been hijacked by extremists like this and I worry that if we don’t stand up to them and say, I’m sorry, this is not allowed, you can’t threaten people into silence, the rest of us are very passive in the face of this,” he added. Police are investigating the attack as a "suspected hate crime," The Daily Caller reports. The group which doxed him -- as well as his brother, Ann Coulter, Sean Hannity and The Daily Caller's Neil Patel -- is still active on Twitter and the group which harassed his wife at their home is still active on Facebook.